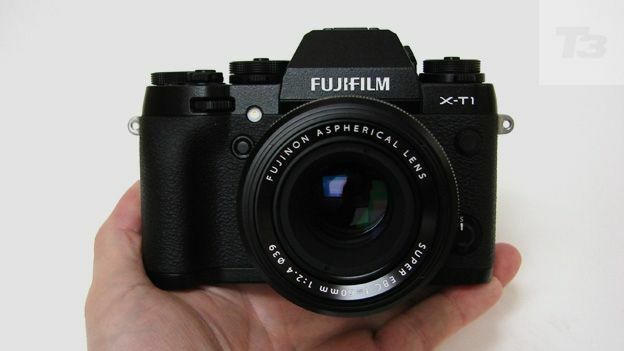 Is the Fujifilm X-T1 premium CSC a good DSLR replacement? Way back in the mid noughties Fuji's DSLR camera range was well respected, even if it failed to 'blow the bloody doors off' when it came to challenging Canon and Nikon's stranglehold on the market. Sensing that it couldn't convincingly compete, Fuji waved the white flag and up until a couple of years ago seemed content to plough its energies into good value point and shoot cameras. However, with smartphones causing manufacturers to re-think or largely abandon their cheaper offerings, Fuji changed tack and went high-end by introducing its £1,000+ Fujifilm X-Pro 1, a compact system camera with retro Leica-type styling upon which the lens could be changed. Now, with various well-received rangefinder styled X' system cameras under its belt, we have the Fujifilm X-T1, another flagship model for just over a grand, but one that doesn't appear a direct X-Pro 1 replacement. For starters the X-T1 is the first in the X family to directly resemble a DSLR, even if it is mirror-less, so technically isn't a DSLR. The appearance is deliberate. Fuji is on record as seeking to expand the audience for its X series and snare some of those sports and wildlife photographers who might otherwise have opted for the likes of the Canon EOS 700D or Nikon D7100. It's trying to do this by promising improved auto focus speed of officially 0.08 seconds when compared to its forebears, up to 8fps burst capture plus weather resistant sealing. One of the additional selling points here is the DSLR-like provision of an eye-level viewfinder alongside the familiar rear plate LCD. Unlike on a traditional DSLR, however, the X-T1 doesn't provide an optical viewfinder; instead it's of the electronic variety. Yet in being larger than just about any we've previously used, and boasting a whopping 2.36-million dot screen resolution, Fuji is claiming it's almost indistinguishable from its optical equivalent. We liked the fact that a built-in eye sensor automatically switches it on for us too. And we get this feature alongside the fact that the X-T1 is smaller and lighter than its semi-pro DSLR equivalents - another major talking point - while also featuring the same sized APS-C chip as most consumer DSLRs. In terms of headline resolution Fuji is playing safe with 16.3 effective million pixels, the same number as its equally retro looking Olympus OM-D E-M1 rival, for one, rather than the 20+ count of Samsung and Sony rivals. Like its competitors the Fuji doesn't come cheap, yet in a straight comparison it's not outrageously expensive either. It's currently a suggested £1,099 body only, or alternatively £1,449 with the 60mm XF series prime lens Fuji sent us to play with. But, as a standalone photographic tool, is it worthy of your investment? The higher-end Fuji X models have always done knobs and dials very well, tightly packing plenty of manual options into a tight space. The X-T1 is no exception in that respect. It looks like a camera for photographers who know what they're doing. For instance we get no fewer than three top plate wheels, for selecting ISO speed - a core range of ISO200-ISO6400 extendable to ISO100 and ISO51200 equivalent in either direction - a second one for controlling shutter speed, and a third for exposure compensation (+/- 3EV). The ISO dial is itself surrounded by a means of selecting the camera's drive modes, including the option for exposure bracketing alongside standard single shot mode. Metering can also be adjusted via a wheel that sits beneath the one for adjusting shutter speed. Those who relish getting hands on will find plenty to love. Squeezed between these dials is a raised shutter release button ergonomically encircled by an on/off switch, a dedicated video record button placed slightly too close to the exposure dial for total comfort, plus a function button that doubles up as means of selecting the camera's Wi-Fi functionality - seemingly something the modern digital camera cannot fail to be seen without. By contrast, the back plate is more minimalist in appearance, largely swallowed up by its articulated 3-inch screen, and a larger than average electronic viewfinder directly above. Playback and delete buttons, plus auto focus lock and auto exposure lock buttons are the size of tack-heads so require fingernail precision to operate. There's no pop-up flash on board for extra illumination if you need it, but Fuji has provided a vacant hotshoe and small clip-on flash out of the box. Of course, you then have to remember to pack said flash, but such omissions are what you trade for having a camera that handles like a DSLR without being quite as bulky. This Fuji offers the convenience of a tilting 3-inch back screen presented in 3:2 aspect ratio, plus the obvious advantage of a high 1,040,000 dot resolution and 100% frame coverage - so what you see is what you get. That's also true of the OLED colour viewfinder ranged directly above it, which here offers a massive 2,360,000 dots of resolution for the viewing pleasure of any photographer who prefers to scrunch their face up against the camera, old school style. The larger screen can be angled up or down, but cannot be swung out at 180° to the body, neither is it a touch screen. Still, a limited amount of angle adjustment, to allow for easier low or high angle shots is better than none at all. The X-T1 offers around 350 shots from a full charge of its lithium-ion battery, which is average for this class of camera and identical to the performance of the likewise DSLR-styled Samsung NX30, even if that camera seems inexpensive by comparison at £899 including 18-55mm zoom. But then the more modernistic Samsung has neither the X-T1's build quality or gorgeously retro-styled charm. The metal-build 60mm XF lens with its bright-ish maximum f/2.4 aperture we were provided with delivers a very shallow depth of field, automatically throwing the background out of focus. This is flattering for portraits and makes for dream-like close ups at a minimum distance of 26.7cm, the transition from sharply focused areas of the image to de-focused ones being rendered with an almost creamy smoothness. Colours really pop too, without appearing unrealistically saturated - even left on standard colour setting. From a standing position, a fixed focal length lens doesn't offer as much flexibility when it comes to framing as say an 18-55mm standard zoom. If you want to alter the framing you either take a few steps back or several in the forward direction. And especially when shooting landscape scenes we felt we couldn't quite squeeze as much into shot as we'd have liked. So anyone entering the X system from scratch and having to invest in a new set of lenses may well want to start with a more all-encompassing kit zoom and work their way up to a prime lens, as necessary. It's also worth noting that when shooting video you'll need to manually adjust focus if switching your point of interest from foreground to background or vice versa. As this is a Fuji camera there is the option of calling up Film Simulation modes. The standard and, therefore, default setting is Provia, the vivid colour setting is Velvia, traditionally most favoured by landscape photographers who want blues and greens to look particularly punchy, with Astia the choice for soft-focus portraiture. We also get the chance to ape colour negative, or shoot in black and white or sepia. Is the DSLR-styled 16MP megapixel Fujifilm X-T1 worth your pennies? Well, with the X camera series the appeal has always been as much, perhaps more, about how the camera looks as to how it performs. Luckily then the X-T1 is an absolute beaut. If we've a grumble it's that the auto focus could have been quicker still and busier scenes can have it hunting around for a subject to lock onto; but if plumping to manually focus this isn't an issue. The X-T1 is a serious piece of gear, and for those who feel an APS-C sensor rather than the full-frame chip of the Sony A7 fits the bill, something of a classic in the making.